The Erhu, the Chinese 2-stringed violin, is an essential leading instrument in the East, as the 4-stringed violin is in the West. Inspired by the historical connection between the two instruments and by YoYo Ma and his Silk Road Project, the crossover ensemble 6-wire was founded by two virtuoso soloists on these instruments. Co-founders Xiang Gao and Cathy Yang write and play world music, crossover chamber music and jazz, performed with synced visual elements integral to each concert and electronic sound libraries designed to pair with each original composition and arrangement. 6-wire ensembles include the 6-wire Duo with Cathy Yang/erhu and Xiang Gao/violin, the 6-wire Trio with pianist Dr. Matthew Brower, a crossover chamber ensemble for classical & contemporary music audiences, the 8-member 6-wire World Music Ensemble and the 6-wire Funk Jazz Band (violin, erhu, zither, saxophone, bass, piano, guitar, percussion and drums). With the advanced wireless system 6-wire provides, the ensemble is able to play outdoor concerts, large sporting events and television productions. 6-wire celebrates diversity while transforming the way live instrumental music is experienced. 6-wire was established in 2010 when Xiang Gao was on the University of Delaware music faculty, and was named Ensemble-in-Residence. That year 6-wire successfully premiered “Sleep now, O Earth” composed by founding member Gao for the U.S. celebration concert of the 40th anniversary of Earth Day. 6-wire was the featured ensemble for the Washington National Opera hosted under the patronage of opera sensation Placido Domingo and Zhang Yesui, Chinese ambassador to the U.S. in May 2011. The ensemble also performed concerts at the Strathmore Performing Art Center and on the University of Delaware Master Players Series. 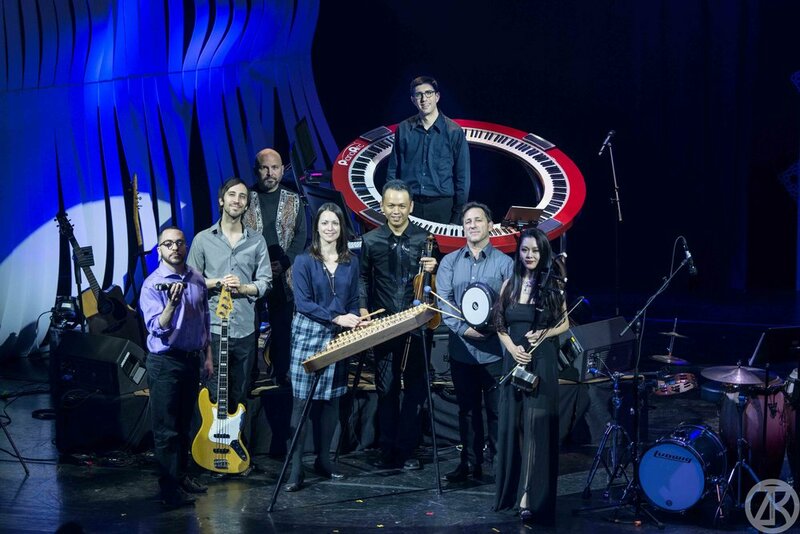 In February 2012 the 6-wire jazz ensemble toured in the U.S. and China, premiering the multimedia theatrical concert “Encounters”, which transported audiences to the Qing Dynasty (1644-1912). 6-wire’s first CD, “the 6ixth sense,” was released in spring 2013, and the following year the ensemble joined the roster of the China Music Foundation and was awarded its first career grant. 6-wire received the Delaware Governor’s Award in 2014 and a Chamber Music America grant in 2015, the same year the ensemble toured Asia for the second time. In 2016 6-wire joined the roster of California Artists Management. 6-wire’s founding member Cathy Yang is an internationally acclaimed erhu virtuoso and guzheng (Chinese zither) soloist who performs frequently throughout China, Europe and the United States. She has performed as a soloist at Lincoln Center and the Kennedy Center, among other major concert halls. The Chinese Government chose Ms. Yang numerous times to be a Chinese cultural ambassador, which included solo performances in Vienna, Frankfurt, Munich, Los Angeles and other major international cities. In May 2008, while visiting the United States, Ms. Yang performed before thousands of New York Mets fans. The successful performance made her the first traditional Chinese musician to appear at Shea Stadium. Ms. Yang was also a featured soloist during the 2008 Spoleto Music Festival in Charleston, South Carolina. As a former professor of music at the China Contemporary Cultural Academy, among the prestigious awards Ms. Yang received in China are top prizes at the Long Yin Instrumental Competition, the Tian Hua erhu competition, the Chinese Ministry of Culture Annual Music Competition, and the Chinese National Cultural Foundation Award. Recognized as one of the world's most successful multifaceted artists of his generation from China, Xiang (Sean) Gao has performed solos with more than 100 symphony orchestras worldwide including the Czech Philharmonic, the Gothenburg Symphony-National Orchestra of Sweden, the St. Petersburg Philharmonic of Russia, the Estonia National Symphony, the Mexico State Symphony, and the Detroit, Kansas City, Knoxville, Memphis and Aspen Music Festival Symphony Orchestras. Mr. Gao has also performed for world leaders including two former U.S. Presidents, the former Chinese President Hu JinTao, and King Carlos I of Spain. Recipient of the Delaware Governor’s Award in the Arts, Mr. Gao’s musical integrity and virtuoso technique have gained accolades from audiences and reviewers around the world. Mr. Gao is the youngest endowed professor at the University of Delaware and the Trustees Distinguished Professor of Music as a composer, arranger and producer, and the “ZiJiang Professor of Music” at the East China Normal University in Shanghai. In 2007, the Stradivari Society in Chicago selected Mr. Gao to be a recipient of world famous Stradivarius violins for his international concerts. Xiang Gao is also the founding artistic director of the University of Delaware Master Players Concert Series, the annual Master Players Festival and School (MPF), and the China Music Foundation (USA). The multifaceted musician and singer songwriter, composes, arranges and performs in the styles of jazz, funk, bluegrass, Asian folk, pop and Latin American music.